SkyVision Centers specializes in the state-of-the-art contact lens technology to maximize your wearing experience. We are pleased to provide one of the newest contact lenses available . . . .The ULTRA® by Bausch & Lomb! At Skyvision Centers we feature the best and most current options from all of the major contact lens companies. From the Acuvue Oasis to the Proclear from Bausch & Lomb, we are sure to have a contact lens option which fits your needs! Daily disposable contact lenses are an option for almost all contact lens wearers. You put a contact lens in your eye in the morning, wear it all day, and then take it out and throw it away every night! What could be more convenient? These lenses are noted for their great comfort, and they are probably the healthiest lens modality. People who suffer from dry eye and people who have allergies do particularly well with daily disposable contact lenses. Since you throw your lens away every night you do not need to use special solutions, and you do not need to worry about where you put your lens case! These lenses are also excellent for people who only wear their contact lenses part-time. 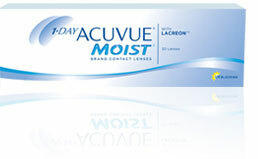 Among the most popular options in daily disposables is the one-day Acuvue Moist. The latest Acuvue technology is called LACREON. This permanently embeds a moisture rich wetting agent in the lens material which reduces friction. The one-day Acuvue Moist is noted for its high breathability, excellent UV protection, and how it maintains a fresh feeling all the way to the end of the day. These lenses have a very light visibility tint which makes them easier to see when you are taking them out of their package and putting them in your eyes. 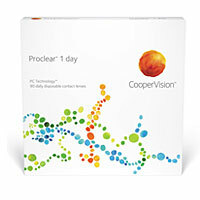 Skyvision also carries BioTrue one-day, Proclear one-day, and DAILIES AquaComfort Plus. On the other end of the spectrum are contact lenses like the Bausch & Lomb PureVision 2HD. These contact lenses are made from a unique material that is exceptionally healthy, so your eyes will feel comfortable all day long and well into the night. PureVision contact lenses are created with truly innovative optics which deliver pure, rich contrast and highly refined detail. PureVision contact lenses are made of AerGel, a unique silicone hydrogel material that lets natural levels of oxygen reach your eyes so they stay comfortable and healthy. The PureVision 2HD is approved for extended wear and can be worn overnight for up to 30 days while you sleep! Acuvue also makes an extended wear Oasis contact lens as well. We also carry several different bifocal contact lens as well. Some patients elect to have contact lenses to correct for up close vision using one presbyopia correcting lens which is referred to as monovision. No matter what you want to do with your contact lenses, our doctors will give you all of your options so you can make the best choice for you! Dr. Gregory Kaye is one of our contact lens specialists! The great doctors here at SkyVision will work with you get the very best vision with your contact lenses! New To Contact Lenses? Not To Worry! If you are new to contact lenses, our doctors will first, determine your suitability after completing a thorough eye examination. We utilize the latest in diagnostic testing, including the Orbscan II corneal topographer which enables us to monitor corneal integrity and the lens – cornea fitting relationships. Most patients can be fit on the same day as their examination. After recommending your best contact lens option, you will then be given personalized instruction on how to wear and care for your new lenses. Our contact lenses are competitively priced and we offer the option of convenient home delivery. Once your account is set up, you can order your contacts through our website on the button "Order Contacts" below or in the PATIENT CENTER. You must be set up by our office first to be able to order online. Your contact lens prescription must be current, within one year. For your very best pricing, please plan your appointments for new prescriptions carefully to avoid running out and needing a "rush" or "holdover" shipment.